Algorithm allows machines to generalize what they learn. Research by Cornell University. While industrial robots are programmed to repeat desired actions, a personal robot working at home has to learn how to handle tomatoes more gently than canned goods. And it shouldn’t stab the home’s occupants with sharp knives, either. So the Cornell team, led by assistant professor Ashutosh Saxena, programmed a Baxter robot from Rethink Robotics to plan its motions. The best option has selects by operator from three possible trajectories on a touch screen and then gives corrective feedback, manually guiding the arms to fine-tune the trajectory. The learning algorithm allows the robot to learn incrementally as it associates a particular trajectory with each type of object. At the checkout counter, quick flips work for cereal boxes but not a carton of eggs. 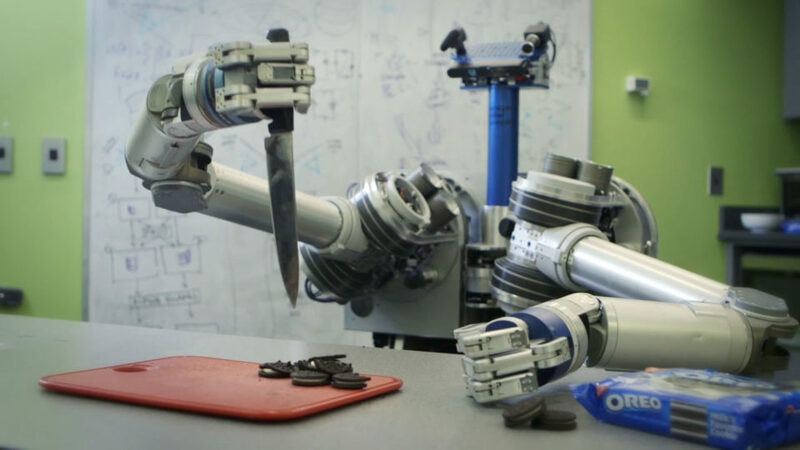 And the robot learns to hold sharp objects in close away from people. Users who were not part of the research team usually could train the robot on a task in five corrective feedbacks, according to the researchers. And the robots also were able to generalize what they learned, adjusting when the object, the environment or both were changed.